The third edition adds several carefully selected refinements. All recordable parameters are now mouse-automatable by clicking and dragging on the indicator, perfect for when you’re stuck with a laptop but no MIDI controller. The GUI now matches Frame, Loupe and Mirage with a clearer layout that is easier on the eyes. Smooth and swing are now static parameters, making room for envelope decay and sample start as recordable parameters. Try modulating sample start with a melodic sample to build the foundation of a track right in ParamDrum. 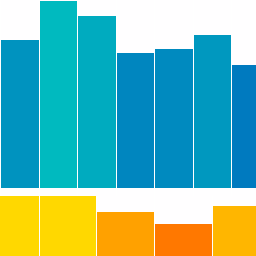 A “Max Vel” switch for each sampler allows full velocity for each step, so step value affects only probability. 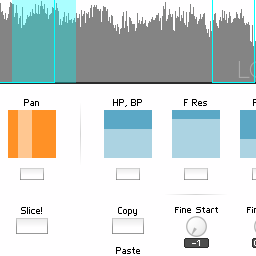 A virtual analogue “sub” kick unit has been added for layering a little extra earthquake with your sampled kicks. ParamDrum TR Edition from Peter Dines on Vimeo. 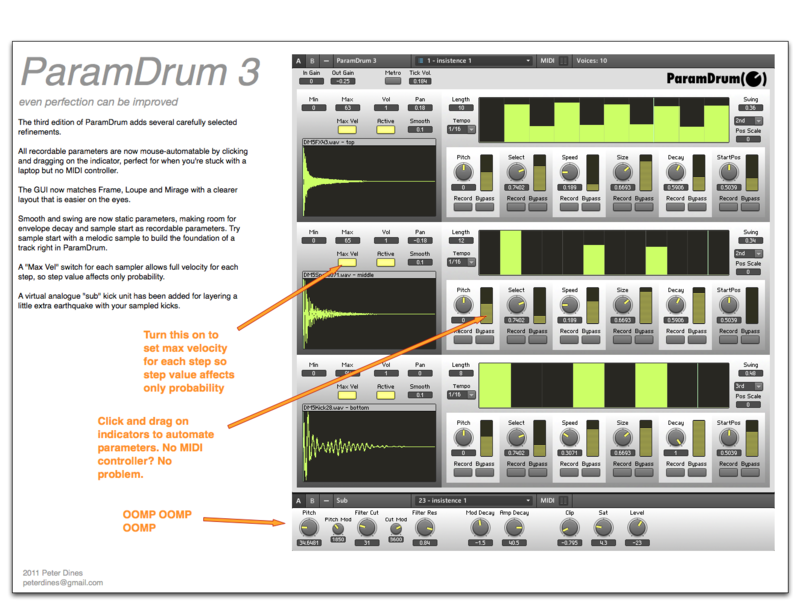 ParamDrum 3 is a free upgrade for anyone who’s already purchased a license and can be downloaded here. Requirements: A computer capable of running Reaktor 5.5. ParamDrum is extremely CPU efficient and unless your computer was hewn from flint by neanderthals you should be more than fine. It takes 2.7% CPU on my 2009 3gHz iMac. Mac users take note: I now recommend SimplyRar for unarchiving password prrotected RAR archives on OS X. Newer versions of The Unarchiver sometimes give error messages when dealing with password protected RAR files. 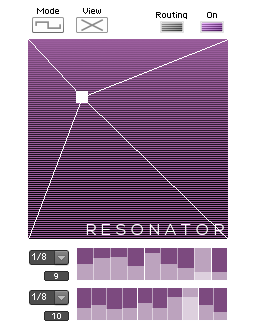 This entry was posted in Downloads, Ensemble, ensembles, Granular, granular sampler, paramdrum and tagged drum machine, drum sequencer, instrument, p, Parameter Lock, reaktor, Reaktor 5, Sampler, Samples, Sampling on March 8, 2011 by peterdines.